Alias (was called PowerAnimator and Animator) was a highly-integrated industrial 3D modeling, animation, and visual effects suite. It has had a long track record, starting with Terminator 2: Judgment Day in 1991 and ending in Star Wars Episode I: The Phantom Menace in 1999. also served as the solution used to produce South Park episodes digitally before production was moved to Maya. Alias served as the precursor to Maya and and AliasStudio (when acquired by Autodesk). DESIGN-ENGINE|EDUCATION offers courses utilizing Maya and AliasStudio… and Rhino. The founders of Alias, Stephen Bingham, Nigel McGrath, Susan McKenna and David Springer wanted to create an easy-to-use software package to produce realistic 3D video animation for the advertising industry and post-production houses. In 1983 they came up with the idea for a software development effort to achieve this goal. Springer was teaching computer programming for designers at Sheridan College. A rare combination of artist and computer programmer, he had been working independently on software which, by coincidence, resembled McKenna’s and Bingham’s idea. They quickly brought him on board, and he supervised the project that involved 300,000 lines of code written in C.
Bingham was an unlikely high-tech tycoon. Lacking any formal engineering or technical training, he obtained a Master’s degree in Canadian studies from Ottawa’s Carleton University. He then served as the director of the city’s National Film Theatre from 1980 to 1983, which allowed him to indulge in his love for movies and animation. It was a visit to Hollywood director George Lucas’s renowned Industrial Light & Magic animation studios in California that inspired Bingham to form his own animation company. Susan McKenna first got the computer itch in high school where she took Fortran. The youngest of five children, she was the first woman in the family to want to enter business with an ambition for adventure and risk. Stephen Bingham and Susan McKenna met at Carleton University in Ottawa. She spent 2 1/2 years doing administrative work in audio-video production, raising capital, writing proposals and arranging funding. McKenna approached Nigel McGrath, knowing his reputation in the industry for mixing high technology and graphic design. After high school, McGrath freelanced as a graphic artist and started McGrath & Associates in 1980 to serve major corporate clients. He kept the company while starting Alias, lending the new firm $500,000 worth of computer graphics equipment. In 1983 they were able to obtain a $61,000 grant from the National Research Council, which, combined with the limited funds of the founders, allowed work to begin on the development of that first code, a huge undertaking that required 36 man-years of programming or 18 programmers writing for two years. Other financial support was gained from the federal government through Scientific Research Tax Credits (SRTCs). The first office, with a rent of $150/month, was located in Toronto in a renovated elevator shaft in the building that would later become the home of CITY-TV. “There were strange drafts, cold air would mysteriously fill the room, like we were in a scene from Spielberg’s Poltergeist”, said Susan McKenna. In 1984 the group decided on the name Alias for their new venture. “I think it was Steve who came up with the name Alias, while we were sitting in a Detroit restaurant during SIGGRAPH”, says Nigel McGrath. “You know what we need is an alias”, Steve said. “We all clicked at that point because the only paying job we had at the time was for Dave Springer to write an anti-aliasing program for a few users at SGI. That’s where the name came from”. Alias unveiled Alias/1 at SIGGRAPH ’85 in San Francisco. Alias/1 was unique because it was based on cardinal splines, producing much smoother and realistic lines or surfaces than polygonal lines. The first sale of Alias/1 was to Post Effects in Chicago followed by Editel in New York and Production Masters in Pittsburgh. Also in 1985, Alias signed a landmark deal with GM to design a system incorporating NURBS (non-uniform rational basis spline) technology compatible with GM’s spline based CAD (computer-aided design) system. This was the beginning of a business relationship that is still thriving today. Later that year, the Alias founders approached Silicon Graphics Inc. and suggested that SGIs super-microcomputer could be used for graphic design. Until that point, SGI’s hardware had only been used for computer-aided design and computer-aided manufacturing (CAD/CAM). SGI spotted the potential for selling a computer every time Alias sold its software. These new research and development efforts required additional capital to finance the effort. Now that Alias had a big client (GM) more or less in hand, the risk was less in the eyes of potential investors. Early in 1986, Crownx, a venture capital company associated with Crown Life, invested $1.2 million for a 20% stake in Alias. Although most of Alias sales had been to small production houses, Kraft and Motorola were added to the new client roster in 1986. Moreover, Alias managed to beat two American bidders to supply the $400,000 computer-controlled TV type equipment that would let the world watch what the Hubble Telescope could see from space. 1986 also saw the introduction of the second generation Alias/2. It had the basis spline geometry that led to the creation of the term CAID (computer- aided industrial design) and a whole new market. In 1987 Alias’ staff increased to 70 people with the opening of three U.S. sales offices. Concurrently, new venture capital was received from US Investors Greylock and TA Associates. Exclusive rights to sell Alias/2 into the entertainment markets were passed in 1988 to a single worldwide reseller BTS (now Phillips BTS) who sold Alias/2 with their Pixelerator rendering machine. The Alias sales focus could remain exclusively on design opportunities, where most sales were direct except for 8 resellers in Asia. Alias boasts an impressive list of customers including Timex, Reebok. Oakley, Kenner, BMW, GM, Honda, Volvo, Apple, GE, Motorola, Sony, Industrial Light and Magic, Broadway Video and The Moving Picture Company. Steve Williams (ex-Alias) went to ILM to help create the pseudopod creature in the 1989 movie The Abyss. Alias 2.4.2 was chosen by Williams for modeling because it was patch-based (B-splines) instead of polygons. The software ran on SGI 4D/70G and 4D/80GT workstations. The Abyss was hailed by the film industry to be one of the most technologically advanced and difficult motion pictures ever filmed. This was proven when ILM received an Academy Award for Best Visual Effects for The Abyss. For the first time, Alias’ software got high-profile recognition in movie animation. In 1989 one of Alias’ most high profile industrial clients, Honda was so pleased with Alias technology that it assisted with the development of the newest version of ALIAS/2. Visiting from Japan, a Honda executive commented: “Thanks to Alias’ software, we have 20 people doing the work of 200.” The 1989 Honda Accord became the first car made by a foreign manufacturer to head the US bestseller list. Many of Honda’s cars, like those of BMW and Volvo, were designed on 3D software created by Alias. Alias raised about US$35 million in their 1990 initial public offering of 2.5 million shares. “US investors understand the value of the investment better. Canadians focus on the trouble with tech stocks and not the money that’s been made trading those stocks”, said founder Bingham. 1990 also saw the introduction of its third generation software, branded Studio for industrial design and PowerAnimator for the entertainment market. That same year Alias client ILM reaped the highest honors for Best Visual Effects at the Academy Awards. PowerAnimator was used to create Arnold Schwarzenegger’s foe, the chromium killer cyborg. Strangely enough, Schwarzeneger who reportedly earned $12 million for that movie, was not the highest paid actor. 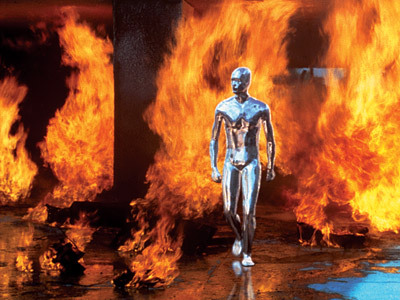 The liquid metal man’s salary worked out to about $460,000 per minute compared to $200,000 per minute for Schwarzeneger. IBM unveiled a new line of workstations n 1990 and promoted Alias software among sales staff and customers. “Alias is the best worldwide in visualization and animation”, said IBM Canada President, John Thompson. Rob Burgess, (now Chairman and CEO of Macromedia) was appointed president of Alias in 1991 with the mission to take the company to the next level of growth. Burgess announced a 3 year strategic alliance with SGI. He also seized the opportunity to purchase the Spacemaker technology and launched UpFront, a low-cost 3D Mac and Windows based package for architects. Alias achieved a major coup by impressing Bill Gates, who mentioned Upfront during a major Microsoft conference as a particularly innovative application under Windows. “In the graphics area, I picked Upfront from Alias Research. It is really an incredible tool for making sure the design is exactly right”, said the Chairman of Microsoft. This project would pave the way for the development of Sketch!, positioned as a tool for graphic artists who wanted to do more realistic 3D work than could be done with Adobe Illustrator. Full Color Division (pre-press and photo retouching). Under the direction of Burgess, Alias pushed toward its dominance of the entertainment and design markets. In the Spring of 1992, new animation features, primarily an IK (inverse kinematics) solver, were included in the fourth version of PowerAnimator. It was used to create many of the effects in Batman Returns which provided a great testimonial for Alias’ return to the entertainment arena at SIGGRAPH ’92. They also showed that they hadn’t forgotten their design market when they introduced AutoStudio, a package specifically tailored to automotive designers. This continues Alias’ focus on the transportation design sub-segment that had done very well for the company. In 1993 Alias started the development of a new entertainment software, later known as Maya which would become the industries most important animation tool. Steven Spielberg chose Industrial Light & Magic to provide the visual effects in 1993’s Jurassic Park. In turn the animators at ILM picked PowerAnimator as the software of choice to model the huge prehistoric beasts. They delivered the very real looking dinosaurs with PowerAnimator and reaped the Oscar for Best Visual Effects. Alias worked in close cooperation with Ford to develop StudioPaint, a high-end paint package designed for automotive sketching and rendering with real-time airbrushes. Rollerblade decided to purchase Alias Studio as the CAID tool of choice for their skate design after extensive benchmark testing. “Alias makes it much easier for our designers to sculpt the complex surfaces required to achieve innovative designs while meeting the constraints required for foot comfort”, explained Todd J. Olson, senior industrial designer for Rollerblade Inc. Alias signed a landmark agreement with Nintendo in 1994 to be the key software tools provider. PowerAnimator was used to create Donkey Kong Country for Nintendo. As a result of these relationships, Alias dominated the games segment with the largest share of revenue. Alias made headlines in the Globe & Mail for helping car companies save both time and money with its industrial design software. “Detroit’s auto makers are able to cut their vehicle’s development time to three years from four-plus.” Automotive and transportation design companies included: GM, Ford, BMW, Volvo, Honda, Toyota, Fiat, Hyundai, Isuzu, Nissan, Renault, Saab, Subaru, Caterpillar, Kenworth and Mitsubishi. In 1994, Ford became the largest StudioPaint installation in the world when it purchase StudioPaint for its revolutionary Global Studio design facility. StudioPaint allowed designers to create “digital concept sketches” using real-time pencils and airbrushes, and “digital facelift” of existing designs using retouching and real-time image transformation tools. Alias’ profits soared in 1994, primarily because of success in the movie industry. They reported a profit increase of 181% for the second quarter of Fiscal ’95. Alias’ PowerAnimator was used in five of the biggest movies in the summer of 1994: Forrest Gump, The Mask, Speed, The Flintstones, True Lies and Star Trek: The Next Generation “A Final Unity”. Alias customers in special effects included the most prominent studios, such as Industrial Light & Magic, Angel Studios, Digital Domain, Dream Quest Images, Cinesite, Metrolight Studios, Pixar, Sony Pictures Imageworks, Video Image, The Walt Disney Company and Warner Brothers. The corporate history of Alias also changed dramatically in 1995, with the merger of Alias and Wavefront. On February 7, 1995, Wavefront Technologies, Inc., Silicon Graphics, Inc. and Alias Research, Inc. announced that they entered into definitive merger agreements. As stated above, the new company’s mission was to focus on developing the world’s most advanced tools for the creation of digital content. 1995 – Alias use in films including Toy Story, Pocahontas, Casper and Golden Eye, and Batman Forever. 1995 – Sega Interactive uses PowerAnimator to create Stars Wars Arcade. 1996 – Alias|Wavefront sets up new offices in Hong Kong, Singapore, Malaysia and Australia. 1996 – Alias|Wavefront’s Chris Landreth is nominated for an Academy Award for the short film, The End, to test new features added to the development of Maya including motion capture, facial animation and hair. 1997- Alias|Wavefront reports a 44% increase in its sales over the previous year in industrial design sales and attributes it to the delivery of new advances in CAID technology as well as the release of new product versions: AliasStudio 8.5, Alias AutoStudio 8.5 and Alias Designer 8.5 Its existing customers include Philips design, Daewoo(UK), Rubbermaid, BMW, Renault, Honda and Audi. 1997 – Ford Motor Company chooses AliasStudio to standardize its existing computer-aided industrial design processes. Valued at over $4 million in sales and services, this is one of the largest sales in the company history. As a significant step in the implementation of Ford’s C3P program, the purchase of AutoStudio represents the automaker’s decision to replace its existing computer-aided industrial design processes and standardize on Alias|Wavefront software. 1997 – Launch of Composer 4.5 featuring motion blur, lens distortion and time warp technology. Effects created with Composer are featured in many Hollywood films including Mars Attacks, Dante’s Peak, Casino, Broken Arrow and Waterworld. 1998 – Alias|Wavefront introduces its new 3D flagship product Maya. Maya is a leader in the industry in the following key areas: bringing characters to life, explosive visual effect and system architecture. Representatives from Blue Sky/VIFX, Cinesite, Dream Pictures Studio, Dream Quest Images, GLC Productions, Kleiser-Walczak, Rhonda Graphics, Square, Santa Barbara Studios and Imagination Plantation were among many of the BETA customers to support Maya. Industrial Light & Magic makes a strategic investment in purchasing enough seats of Maya to give technical directors and artists throughout its digital production departments extensive use of Alias/Wavefront’s most advanced 3D software. 1998 – Academy Award Plaques are awarded to Bill Kovacs and Roy Hall of Wavefront for the development of Advanced Visualizer. Certificates are awarded to Jim Keating, Michael Warhman and Richard Hollander for their contribution to the development of the Advanced Visualizer. Plaques are also awarded to John Gibson, Rob Krieger, Milan Novacek, Glen Ozymok and Dave Springer for PowerAnimator. Advanced Visualizer is acknowledged by the Academy as the first commercial software package for modeling, animating and rendering adopted into widespread use to create digital images with sufficient quality for motion pictures. 1998 – Chris Landreth produces Bingo, an animated short, to run Maya through its paces, pushing the product to its limits and making sure it lives up to the industry’s expectations. In Bingo, Chris Landreth introduces a cast of animated characters who are human-like and disturbingly freakish. Bingo garners international attention and is recognized at film festivals around the world. 1999 – Alias|Wavefront announces industrial design software Studio and DesignStudio for the Windows NT platform. Studio and DesignStudio is the choice of major automotive companies such as BMW, Fiat, Ford, Honda, Italdesign, and Renault. 1999 – Maya Complete incorporates all of the tools and features for world class animation on both IRIX and NT platforms. Maya Complete has been developed to provide state-of-the-art 3D solutions for a more broader, professional market. Maya Complete includes Alias|Wavefront’s award winning 3D modeling, rendering, and animation technology. 1999 – Maya Unlimited, the new graphics production suite for high-end film and video industry is introduced. Maya Unlimited incorporates all of Maya Complete elements plus Maya Cloth, Maya Fur, Maya Live, and Maya Power Modeling. Maya Unlimited addresses the unique needs of high-end production houses, by providing them with tools that will help solve complex problems. 1999 – A subset of Maya Complete, Maya Builder was optimized to address the specific needs of level designers and programmers in the game and interactive title development community. 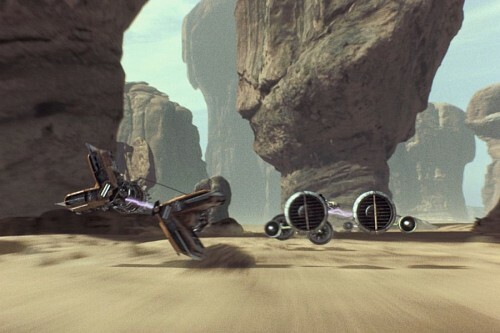 1999 – Alias|Wavefront announces at SIGGRAPH ’99 that Maya has been used by Industrial Light & Magic (ILM) in the summer blockbusters Star Wars: Episode I “The Phantom Menace,” The Mummy, and Wild, Wild West. 2000 – Alias |Wavefront includes a universal rendering policy for the release of Maya 3 that enables Maya Complete and Maya Unlimited customers to “float” the Maya Batch Renderer across any number of machines on Windows NT, IRIX and Linux platforms. 2000 – Alias|Wavefront announces its intentions in bringing Maya to the Apple® Mac® OS X platform. 2000 – Maya was used to create the top four selling December 2000 titles for the PlayStation® 2 console. Electronic Arts (EA) Madden NFL 2001 led the list of top-sellers for December with SSX: Snowboard Supercross (EA) second, Tekken Tag Tournament (Namco) third, and NHL 2001 (EA) fourth. All three nominees for Best Visual Effects in a motion picture used Alias |Wavefront software. The Matrix, (Manex) Stuart Little, (Sony) and Star Wars Episode I: The Phantom Menace, (ILM) were rewarded with nominations for the ground breaking work in film. The Matrix went home with the Oscar. 2001 – In March, Alias|Wavefront ships entire suite of Maya 3D software products to the Red Hat™ Linux® operating system. 2001 – Alias|Wavefront expansion program continues with the release of version of its 3D computer-aided industrial design (CAID) software family, StudioTools, made specifically for the Hewlett-Packard® HP-UX® operating system. 2001 – Maya software played a pivotal role in allowing Square® USA to create a 23-digital-person cast for the much anticipated summer film Final Fantasy. 2001 – The recently unveiled mental ray® for Maya technology ships. To receive more info about 3D Design Training at Design Engine in AliasStudio, Maya, or Rhino or to see the other courses we offer, CLICK HERE to fill out a form or call us at 312.226.8339. To find JOBS that utilize these softwares, CLICK HERE or go to jobs.designengine.com.